Custom Lawns of Omaha is a locally owned and operated lawn care company in the Omaha area. 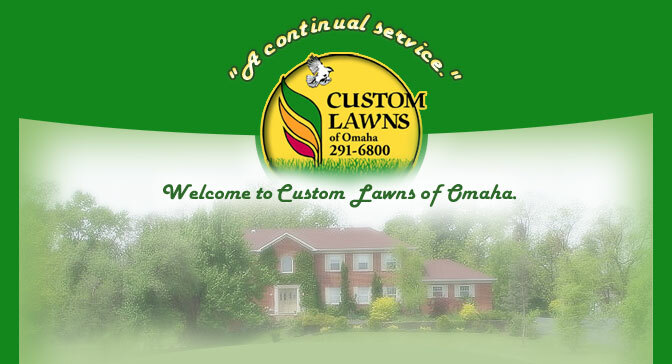 Since 1980 Custom Lawns of Omaha has been committed to providing top-quality service. As one of the most respected lawn care companies in the city, our main goal is to make your lawn look the best it can. Custom Lawns of Omaha may not be the cheapest, however we feel we offer the best lawn care service. We keep the homeowner's best interests in mind. We are not here to sell you products and services you do not need, we offer you advice and an honest opinion to help you make your lawn look its best. Our lawn care programs are customized to give you the thickest, greenest lawns possible. Our goal is to minimize weeds and disease and to keep your lawn as strong and healthy as possible. We offer the best, most affordable organic lawncare program in the Omaha/Council Bluffs metro area. Our organic program is high in amino acids and gives your lawn a thick, healthy look and feel. Custom Lawns of Omaha offers early prepay discounts, electronic payments, emailed invoices and online services. Our website has been designed to be as customer friendly as possible. Our other services include insect control and lawn aerating. We deliver the best services while utilizing the best lawn care methods, materials and equipment available. This helps to keep Custom Lawns on the top of the lawn care industry. Custom Lawns of Omaha helps you make your lawn look its best.